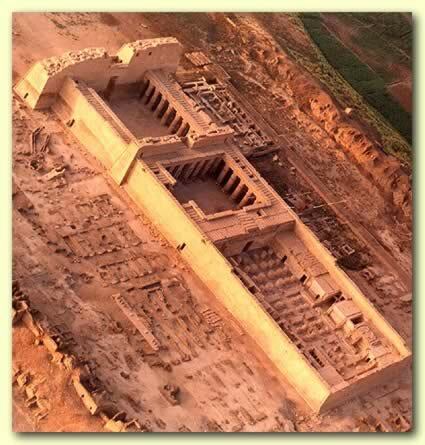 Medinet Habu is the site of the imposing mortuary temple of Ramses III at Thebes, which is situated on the west bank of the Nile opposite Luxor. Adorning its walls are graphic images of the pharoah’s victory over the ‘Sea Peoples’. A number of Atlantologists, who subscribe to the idea that these vanquished warriors were Atlanteans, have seen these carvings as firm evidence for the existence of Atlantis. Jürgen Spanuth is probably the best-known exponent of this theory in which he refers to them as ‘North Sea Peoples’. He supports his view with images from Medinet Habu depicting some of the invaders with horned helmets similar to that to that generally believed to have been used by of the Vikings. However, the Vikings did not use horned helmets(a) and those shown by Spanuth were in fact for ceremonial purposwes, showing no signs of combat damage. Apart from that I suggest that it is highly improbable that headgear failed to evolve between the time of Medinet Habu and that of the Vikings. However, there is evidence that horned helmets were used by Bronze Age warriors from both Sardinia and Corsica. More recently the idea of identifying the Sea Peoples with the Atlanteans has been adopted by two other German investigators, Jürgen Hepke and Rainer Kühne.